Cervical plate systems must adapt to the biomechanical processes in the cervical spine in the best possible way to enable optimum fusion results. This is why the cervical plates developed by SIGNUS have a flat and semi-rigid design, which promotes optimum load transfer to the bone and prevents the stress-shielding effect (Wolff’s law) – while simultaneously preventing tissue irritations. The positive influence of this plate design on fusion has already been proven in studies [1,2]. The new ASCOT plate offers a crucial advantage: an expansion ring integrated in the plate hole is activated when the screw is screwed in and effectively prevents the postoperative back-out. An additional surgical step is therefore unnecessary. 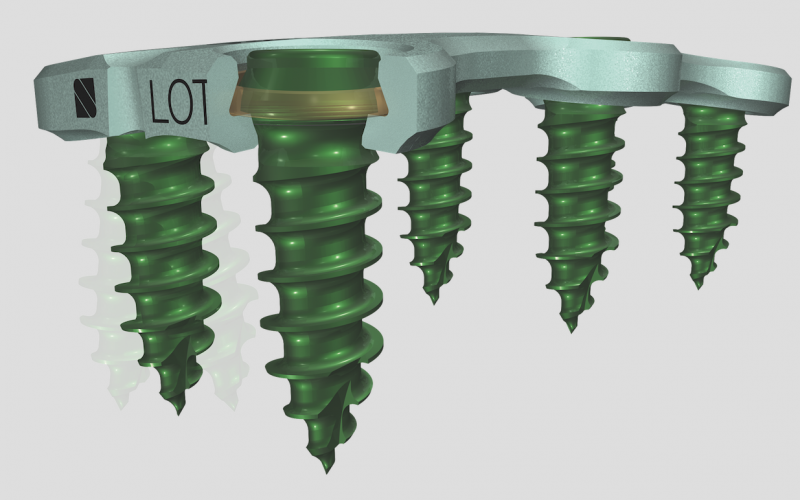 Due to the high degree of angle variability of the screws (10° in every direction), implantation is greatly facilitated, as the plate can then adapt to the patient anatomy. The plate’s extra narrow profile and generous fenestration gives the surgeon an unimpeded view of the intervertebral space during surgery, thus providing additional safety.